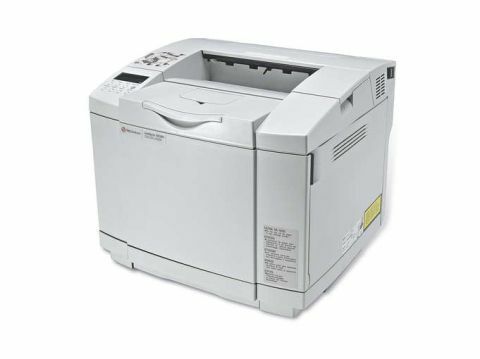 Just a few years ago, no-one would have batted an eyelid at this printer from TallyGenicom, with the plastics and styling fitting into any typical office from the early 1990s. Now, however, we're a bit more discerning. We may want a workhorse printer, but we don't want it to look like the back-end of a bus. Still, the design isn't the be all and end all - especially when it comes to this printer, as the performance makes up for the lack of style. The Intelliprint 8008N certainly makes an immediate impression. It clunks and creaks during warm-up, and is noisier than a lot of other printers we've seen. Even so, great specifications still make it excellent value for money. Ethernet and USB 2.0 come as standard, plus there's a 600x600dpi print engine and an integral paper tray that can hold 250 sheets of plain A4 paper (but no external paper level indicator). An LCD display provides easy menu navigation - all the menus are clear and simple to follow. In terms of output, we'll start with the 8008N's strong suit: text. The printer produces flawless clean, crisp text down to small sizes, with each character a solid shade. Excellent stuff. When it comes to colour images, though, they're a bit of a mixed bag, with an acceptable level of detail but a rather disappointing grainy finish. Colours aren't as punchy or solid as we would liked to have seen, either. The design is long in the tooth, too, and the random noises the printer makes do start to grate after a while. It's a shame, really. If colour reproduction had been a touch better, we'd have happily overcome our reservations regarding 8008N's design foibles and noisy operation. Still, at the price it's still a good printer that's good value for money.